Bethanne Knudson and Stephan Michelson are the founders of The Oriole Mill in Hendersonville, North Carolina. 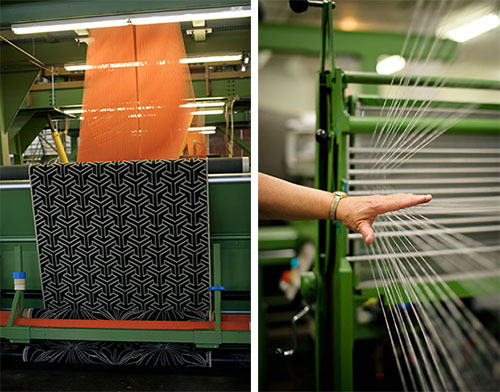 It is here they partake and oversee in the production of jacquard fabrics to create luxurious textiles for the home. To their credit, 100% of the designing and weaving, the cutting and the sewing, happens at The Mill. To create luxurious, super soft throws, coverlets, pillows and shams, they rely on fabrics that are warm and cozy, yet breathable. All of their textiles are made from natural fibers of cotton, wool, alpaca, linen and/or bamboo. And to ensure high quality and low impact, no chemicals are used in the weaving or finishing at the Mill. They currently offer four different collections. This one, the Brooklyn Collection shows off their manly side. As Bethanne shared, "It's a masculine, urban bed that was inspired by a fabric we make that is reminiscent of men's wear." Inside the Mill, you'll find Sew Co., founded by Libby O'Bryan. As stated on their site, "Sew Co.'s crew is composed of veteran factory workers who learned how to sew on the job during the South's manufacturing heydays of the 60's and 70's and have been sewing ever since." The vets work alongside women who have studied fine dressmaking and costume design, so it's safe to say this is an impressive group of artisans. Together they utilize eight Jacquard and two high speed Dobby looms to create their fabrics. It was very important for Bethanne to create a manufacturing company much different from those of the past. Every step of the process happens under one roof, ensuring quality control- plus, it's very much a team effort here. Learn more about The Oriole Mill and see the entirety of their scrumptious, luxurious collections, here.